Read the latest news in the world of Human Resources - all about hiring, firing and salaries! SummaryOur cover story for this issue talks about one of the fastest growing sectors of the Indian economy today ï¿½ Consulting, and more specifically, HR Consulting. To delve deep into the topic, The Human Factor organised a Panel Discussion recently, inviting industry experts Arvind Pandit (The Hay Group), Avantika Susan Nigam (Hewitt Associates), Asoke Laha (Interra Information Technologies) and Mohinish Sinha (iDiscoveri), to debate on the scope and outlook of the HR consulting industry in India. The cover article features the discussion that took place at the aboveï¿½mentioned forum, revealing new insights about the topic, and is backed up by industry inputs from 6 different companies, wherein the contributors talk about their experiences working with HR consultants. SummaryThe HR consulting industry has grown substantially in the 21st century, with average sales revenues last year of over US$1 billion between the top 7 global firms. With the rising demand for consulting, companies are increasingly sending their consultants abroad for short-term assignments, which not only give them valuable experience, but also help the companies gain access to new markets. The authors study this trend, and tell us why this option may turn out to be the least-cost option for clients. Their view is substantiated with inputs from Mr. Amandeep Gupta (Dalmia Cement) and Dr. Latukha Marina (St. Petersburg State University), amongst others. SummaryThe author is heading HR for the Frontline Group of Companies, and he tells us how consultants today are using Assessment and Development Centres (ADC) to ensure transparency in placement and succession decisions. ADC not only provides the right kind of candidate but also offers an opportunity for others to work on the areas in which they are found lacking. Mr. Balaji Ganapathy from TCS further tells us about consulting in the industry, organisational and individual perspective, and how India can leverage its potential as an emerging market. Summary Everyday all of us are forced to make decisions that affect those around us - and this is especially true if one is an HR manager! Mr. Rajkamal Gupta, Vice President ï¿½ HR of The RKJ Group tells us about the Best Decision he made as an HR manager, wherein he was driven to finding the right blend between Human Resources and Industrial Relations. In the same section, Mr. Pragun Thadani, Assistant Manager ï¿½ HR at Fullerton India, discusses with us the Toughest Decision he had to make, which involved firing his own superior, on the charge of misappropriation of company funds. SummaryIn a stimulating interview with the Chairman of A.T. Kearneyï¿½s Indian operations, The Human Factor finds out more about the consulting arena in and around India, and what it takes to be a successful consultant, when your clients are the biggest names in the industry. A.T. Kearney has come a long way since they kicked off their Indian operations, working from a hotel in Delhi. Mr. Gupta shares with us the biggest HR challenges faced by his company at present, and also reveals for our readers, his tips for aspiring consultants. Recollect the basics before making presentations to ensure audiences are swept off their feet! SummaryDespite plenty being written about the importance of communicating and expressing oneself well, many of us tend to forget the basics when it comes to implementation. In this new section, The Human Factor will bring to you a different aspect of communication in every issue ï¿½ points that one may frequently forget in spite of interacting with people every day. In this issue, the author, the COO of FiNoble Advisors, tells us about his favourite public speakers and the characteristics that enable them to sweep audiences off their feet, even when discussing topics which may not be entirely listener - friendly! ï¿½	Indranil Banerjee, Manager ï¿½ Personnel and Administration, Corporate Industrial Relations at West Bengal State Electricity Distribution Company Ltd.
ï¿½	Sohrab Khan, HR Manager at Keane India Ltd.
SummaryThis new section introduced in The Human Factor will bring to you stories about innovation in the field of HR. It is our aim to highlight HR practices beyond the corporate world, and this includes instances of ï¿½People Managementï¿½, rather than solely management of ï¿½Human Resourcesï¿½. For this issue, P.J. Weyforth, the Vice President (Customer Care Operations) at Convergys Corporation, tells us about the technology, known as the Early Warning System, developed by her company, which helps tackle attrition proactively, by gauging employee attitudes towards the organisation. 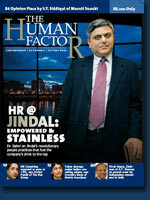 HR Interview: Jindal Steel and Power Ltd.
SummaryThe Human Factor conducted a thought-provoking interview with Dr. Sahni, from the Jindal Group, and learnt how the duties of an HR manager today stretch beyond the conventional job description, encompassing good corporate citizenship, alongwith a strong emphasis on corporate social responsibility. Being a part of one of the biggest and most ï¿½ trusted brand names in India ensures that Dr. Sahniï¿½s HR team leads the way in employing technology that aids recruitment, placement, as well as performance appraisal for employees in their organisation. Summary Male and female employees differ in many aspects of management, such as leadership styles, personal and business backgrounds, and motivation. Yet, they both grapple with many similar business issues, including the need to continuously change and innovate. Prof. Aida Idris, Lecturer at the University of Malaya, has conducted research focusing specifically on women, and she reveals to us the factors that help bring out innovation and creativity in women. Knowing what motivates women will help HR managers globally learn more about ideal HR practices, and aid them in understanding their female employees better. Donï¿½t Neglect the Baby Boomers! SummaryWith the baby boomersï¿½ generation (that is, those born between the years 1946 to 1964) retiring soon, there is likely to be a large gap between the demand and supply of workforce throughout the world. Also, the decades of years and experience stored in the minds of the baby boomersï¿½ generation will be lost, and it may be difficult to transfer the learning to the new employees. Hence, the composition of the workforce of companies everywhere is likely to change, and this article focuses on the difficulties of older employees in companies, prejudices they have to face, and suggests concepts for personnel development that aim at an older workforce. SummaryIn recent years, most companies the world over have been searching intently for better ways to share knowledge with and amongst their employees. This article is a result of the authorï¿½s research, spanning over 4 years, in an attempt to identify how top companies today share knowledge successfully over space and time. Taking the example of ï¿½gold medalistsï¿½ such as Shell, Lafarge and British Petroleum, Dr. Stadler discusses the tricky aspect of transferring knowledge, and how it can be simplified through the unfolding of learning ï¿½ oriented culture, stories, training, mechanisms and leadership in the organisation. SummaryThe definition of the term ï¿½mentoringï¿½ has been expanding vastly and it now includes personal as well as professional coaching. The importance of mentoring can be highlighted by the fact that even in Homerï¿½s famous poem ï¿½The Odysseyï¿½, Telemachus, son of King Ulysses, is aided by a protective and supporting figure called his Mentor. This article, written by the Chief Administrative Officer of Mindlogicx Infotech Ltd., discusses the importance of the mentoring process, and how it can be used to the advantage of both the mentor and his/her protï¿½gï¿½, and includes inputs by Mr. Ajeet Chauhan, the Vice President ï¿½ HR at Nirulaï¿½s Corner House Ltd. The complexity in Indiaï¿½s employment laws is leaving many HR managers confused! Summary The author has 18 years of experience with Maruti Udyog and 7 years of teaching experience in the fields of HR and Law. He provides us with a handy toolkit of legal advice that every HR manager should know about. In this article, he discusses the antiquity of the Indian labour laws, and how they are responsible for containing the progress of India. Peppered with examples, this is an article for the knowledge worker of today.